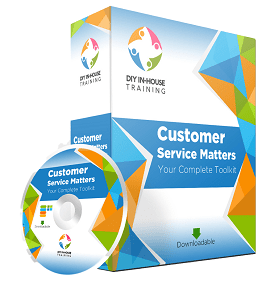 Our DIY Customer Service Matters toolkit has been created after much research and real-life experience. We have done all possible to include an exhaustive collection of materials that you will need to provide effective and long lasting training that will change the way your staff interact with customers forever. Delving deep, we will show you how to tackle problem areas that may be spoiling your image. Ask yourself; could service delivery be improved? Is reliability always what it should be? By getting your team involved in the training process in-house, they can contribute their own thoughts and come up with suggestions as to how you can work together to tackle specific issues. We recommend that every employee is included in the training, no matter their role within the company as morale will be boosted and staff will begin to appreciate the many benefits accrued from working as a team. Time after time, our clients tell us that they are amazed at the positive effect that the training has upon their business and their customer service offering. Definitions - what is customer service? It is essential that your staff maintain interest and do not get bored during the training process; for this reason, we also include interactive puzzles and ice-breakers to set the mood and encourage essential participation. Your employees will have a detailed and comprehensive knowledge of exactly what they need to do and how they should behave in order to provide great customer service constantly. Each will have a personal list, specifically aimed at them, that will provide them with a precise list of actions they need to take in order to achieve it. Your company will benefit immensely and staff will be highly motivated and energized. Once you lose a customer, it is very difficult to get them back. By training your staff in the correct way, current customer retention rates will increase and new customers will be constantly attracted. Click here to see sample slides from the DIY customer service kit.